Programs are hands-on and last 90 minutes, including a PowerPoint presentation and time to create with well-planned, expert guidance. Maximum 30. All supplies and handouts are provided. Themes include Summer Reading, How to Draw, Seasonal, Multicultural and Just for Fun. Scroll down to see the programs currently available. Enter your library email address to be hear about new programs available each season. iREAD Summer 2019: It’s Showtime! Practice drawing some of your favorite movie characters, like Trolls, Minions and Jack Jack from The Incredibles. Then choose your favorite to draw on watercolor paper and paint using watercolor pencils under Christine’s guidance. Beginners are welcome as we explore imagery from the beloved books that became blockbuster movies. We’ll study some of the chapter heading illustrations from the books. Christine will teach you easy drawing techniques to capture the magic as you create your own small copy. Choose your favorite animal, real or imaginary, to draw on watercolor paper, either free hand or using one of the provided printouts. You’ll transfer the outline to watercolor paper, then Christine will teach you how to paint a galaxy pattern inside of your animal. Learn how to draw a few different kinds of owls. Then you'll choose your favorite one to make into a final drawing that you'll complete with shading techniques for some extra realism. Perfect for fall! Fortnite is a fun, crazy video game that kids love. Even if you don’t know much about the game, come join us and learn to draw some of the random characters and skins like Pink Teddy, Bitemark Pickaxe, Unicorn Llama and more. Everybody loves dogs! Learn how to draw several different breeds in this fun class. First we’ll practice drawing two different dogs all together in a step by step process. Then you’ll choose your favorite to turn into a finished drawing. Join us for this fun multicultural program. We'll learn about the sacred Mexican holiday Dia de los Muertos and some of the cheerfully creepy artwork that comes with it. Then we'll make our own drawings inspired by colorful sugar skull candies. Come learn about henna hand designs of India. 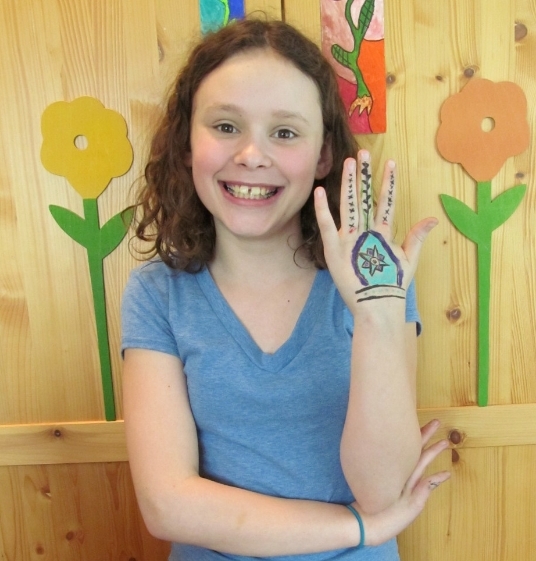 You'll practice sketching popular henna motifs and then paint your own hands using washable water color pencils. A fun multicultural program! Learn about the Australian Aboriginal tradition of telling creation stories through symbolic paintings, called “dreaming”. Then use collage and tempera paint to create your own “Dreamtime” art. A fun multicultural program! Join us for this fun art program and get into the creative groove of abstract painting. Christine will teach techniques for painting to the rhythm of music using watercolor pencils. You’ll leave with a small finished painting. First we'll practice drawing different types of dinosaurs all together. Then choose which one to turn into a painting using watercolor pencils under Christine's step-by-step guidance. First you'll draw an owl on watercolor paper under Christine's step by step guidance. Then you'll learn to paint with watercolor pencils, bringing your owl to life with colors of your choice. Celebrate the season and express your creativity with this fun painting workshop. First we'll draw a butterfly on watercolor paper from photo reference. Then learn to use watercolor pencils under Christine's guidance to add vibrant color to your painting. Celebrate your favorite Chicago team with this fun painting workshop. We'll talk about how sports logos are designed. Then you'll choose your favorite team logo, learn to transfer a drawing to watercolor paper, outline with sharpies, and add color with watercolor pencils. In this drawing class, you are the inventor! First you’ll practice drawing a robot step-by-step with Christine. Then you’ll draw the robot of your choice, either using worksheets for guidance or entirely from your own imagination. Learn to draw Pokémon characters with art teacher Christine Thornton. We'll draw all together following a step-by-step process. Then draw whichever Pokémon you want, with lots of worksheets and Christine's help to guide you. Everybody loves dogs! Learn how to draw several different breeds in this fun class. First we’ll practice drawing two different dogs all together in a step by step process. Then you’ll choose your favorite to turn into a finished drawing, outlining with marker, coloring with colored pencils and adding a background.